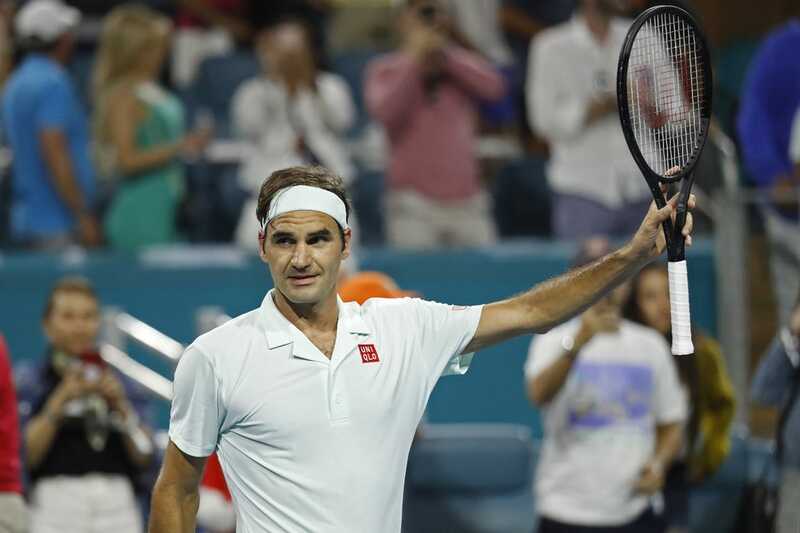 Switzerland's Roger Federer put last year's first-round loss at the Miami Open in the rearview mirror on Saturday, defeating Radu Albot of Moldova 4-6, 7-5, 6-3 in 2 hours and 10 minutes. Albot didn't make it easy for the three-time champion, pushing him to the brink of defeat in the second set. But Federer, the fourth seed, survived mostly on the strength of his serve. He racked up 14 aces and allowed just four break-point opportunities over the entire match. He also won 77 percent of his first-service points and 69 percent of his second-service points. "I expected a player with a great attitude, which he showed. An aggressive baseliner, who moves well. He's not afraid to come to the net. The problem is I've never practiced with him. I've never really seen him play live matches," Federer said. "I thought it was hard. I have a lot of respect for those types of players who don't have the size, have to find a different way to win. He's a great, great player. I was impressed." Federer also noted he was impressed with the tournament's new venue -- the much larger Hard Rock Stadium. "It's always going to feel very different in a massive place like this," said Federer, referring to the new stadium. "It was definitely different, especially very different to Key Biscayne last year. I'm happy I got it out of the way. I'm happy I was able to find a way tonight. "It was a good atmosphere at the end. I thought it was quite electric, how it usually is in Miami. I'm happy that hasn't gone away." Federer will meet Serbia's Filip Krajinovic in the third round. The two have met twice previously, with Federer winning both contests. Krajinovic defeated No. 30 seed Stan Wawrinka of Switzerland 5-7, 6-2, 7-6 (5) earlier in the day. Meanwhile, the highest seed in action on Saturday was ousted, as 36-year-old Spaniard David Ferrer rallied to stun No. 2 Alexander Zverev of Germany 2-6, 7-5, 6-3. Ferrer, the former world No. 3 who is set to retire after the Mutua Madrid Open in May, took advantage of Zverev's serving troubles, forcing 14 break-point opportunities and converting five. It was Ferrer's first win over a top-five opponent since 2015. Zverev, who also had 12 double faults, joins No. 2 seed Dominic Thiem of Austria as top seeds to lose their first match, after Thiem fell on Friday. Seeded players advancing Saturday included No. 6 Kevin Anderson of South Africa, who needed three sets to beat Spaniard Jaume Munar 6-4, 3-6, 6-3; No. 8 Stefanos Tsitsipas of Greece, who beat American Mackenzie McDonald 7-6 (4), 6-1; No. 13 Daniil Medvedev of Russia, No. 14 Marco Cecchinato of Italy; No. 18 David Goffin of Belgium; No. 20 Denis Shapovalov of Canada, No. 24 Grigor Dimitrov of Bulgaria and No. 28 Frances Tiafoe of the U.S.
Seeded players who were ousted Saturday included No. 9 Marin Cilic of Croatia, who lost to Russia's Andrey Rublev 6-4, 6-4, and No. 10 Karen Khachanov of Russia, who fell to Australian Jordan Thompson 6-2, 6-3. No. 21 Diego Schwartzman and No. 26 Guido Pella of Argentina, and No. 31 Steve Johnson of the U.S. also failed to advance. Thu, 25 Apr 2019 20:25:25 EST Curry: 'No panic' despite Warriors' loss, sending series back L.A.